You are here: Home » Can Occupy occupy strategy? A strategy for and by the people? For the last couple of months I have joined in a variety of peaceful protests, celebrations and collaborative enterprises along with millions of other Occupiers rising up across the globe to usher in a new world. Passers by, media analysts and pundits, invariably asked us what was this new world we all wanted… And of course you know as well as I, the answers remained elusive, confounded those on the right and many on the left! While our demands have been directed towards rooting out political corruption and Corporatocracy – more broadly we have laid claim to occupying everything, everywhere, and as a consequence our demands have become limitless. As time has gone by the growing number of wishes and dreams expressed through forums such as working groups (WGs) has meant a multiplicity of new events and actions springing up. This means Occupy is dealing with increasingly complex issues across working groups, GAs and the camps. Meanwhile a “pernicious spirit of aesthetic anarchism” signified by the phrase “damn the plan” (see here) or a general attitude against organization is often witnessed. This attitude says Charles Lenchner has led to issues such as high bounce rate, a lack of an engagement ladder and the propensity to attract ‘Disruptive Newcomers and Empowered Insiders’ (see here). These issues have compelled more and more people to wonder where this movement was going and what strategies people had in mind to scale up from protest and occupation to a social movement. When I first thought about strategy one of the first things it evoked in my mind was images of chess pieces, military generals, top down decision making, and trophy hunters – the competitive advantage. So what kind of approach to strategy could reflect the movements bottom-up, non-hierarchical nature and give Occupy the collaborative advantage? 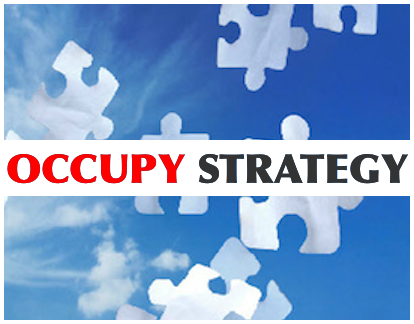 Could we occupy strategy and reclaim the term “strategy” for and by the people? To begin answering these questions this blog post centers on the discussions of the Strategic Planning WG (SPWG) of Occupy Venice, CA. This is something that Steiner has had to address several times, and can be seen repeatedly in working groups who understandably have a propensity to fall back into learned behaviors from the all-action, quick fix culture that surrounds us. It is this goal that lies at the heart of the overall mission of this WG, and drives the gradual formation of a coherent mission statement. They are also addressing, from that perspective, two vital areas – the enhancement of co-ordination and the facilitation of education. Those areas address the development of capacities both among occupiers, and in the rest of society. The WG has begun to develop a survey for operational management on such issues as time keeping, is discussing the use of SWOT (strengths, weaknesses, opportunities, threats) analysis in creating a mission and vision, and beginning to develop agreed upon language and the approach to pitching them. There is also an emergent possibility for the group to carry out “community asset mapping” described in this blog post by Donnie Maclurcan. There’s a great deal of interest to see the completion of surveys, including the asset map online. With peer-to-peer innovations on the sharp rise before the rise of America’s first true internet-era movement, the global Occupy movement has begun the new year scaling up its online architecture. This will help WGs such as these to coordinate within and between working groups and out to the wider public. Given the reflective nature of strategic development, the work of this WG involves a lot of reading and discussion. Members developed a list of things to read to educate themselves about both the strategies of historical popular movements, and the processes of strategic planning, including such gems as Bill Moyer’s Movement Action Plan (1987) and Gene Sharp’s From Dictatorship to Democracy (2002). To accelerate their learning, they are sharing their reading notes with each other, here. “(At the GA) …I suggested that we don’t try to fix every issue, but that we bring all the issues under the Occupy umbrella to show people we are trying to mobilize that every problem we face is all due to corporate control of our society. These ideas look similar to some of those found on Shareable.net, and as you may have read in the post on Asset Mapping, Donnie Maclurcan mentions other forms of economy, too, such as the Solidarity Economy, the Blue Economy and the Steady State Economy. Whether the ideas introduced there will turn into action and reality will depend on how much traction they gain with the grassroots. Some of them are already implemented and you can read about them here. Reflecting on all these developments, I am intrigued to see how a working group still in its early days of existence, is already showing signs of embracing the kind of strategy that can become a model for other strategy WGs as well. Both co-ordination and education have been identified as key areas of focus for attracting occupiers into the movement and retaining existing ones, amplified by the use and increased integration with online social media platforms and surveying/mapping. The cultivation of authentic relationships through commoning binds all of these elements together into a strategic model that reflects the radical spirit of Occupy. 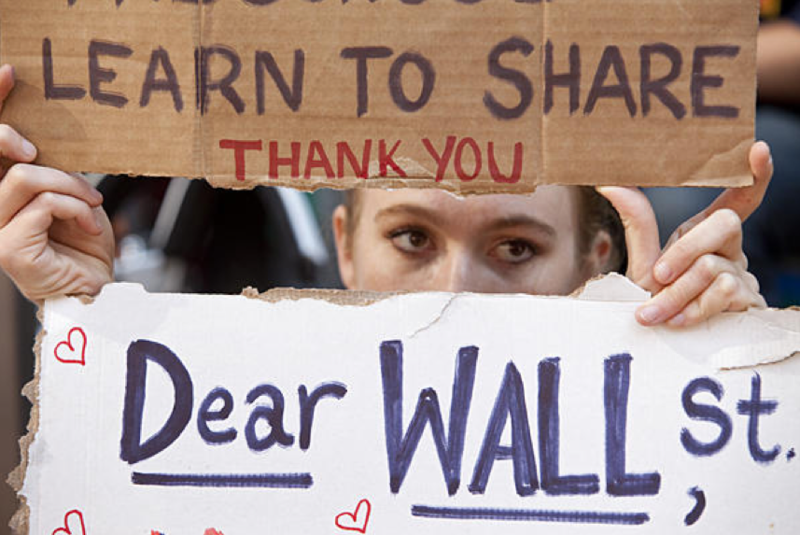 Although at time of writing (Feb 5th 2012), the SPWG at Occupy Venice, CA are yet to produce a mission statement that would incorporate all their discussions, they are learning and beginning to implement these ideas. It is our view that ideas such as these can begin to offer a plan that reflects the spirit of occupy, manages complexity at increasing scale, keeps the power in the community and away from experts or the hegemony of any one individual, and attracts and retains new people to the cause. Some more ideas for learning and forming communities based on commons principles include Marvin T Brown’s Civilizing the Economy and Charles Eisenstein’s Sacred Economics. 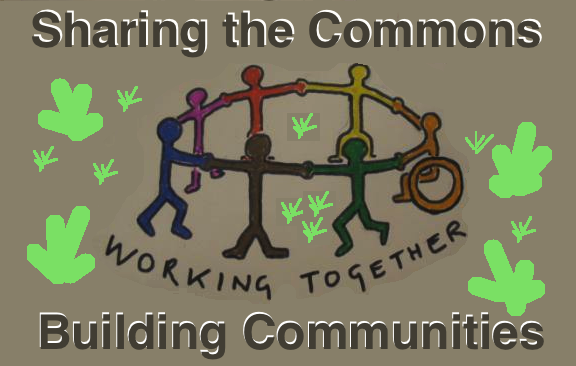 There is also a substantial store of information about the transition to a commons-based society in the Community Knowledge Garden of the School of Commoning. The most exciting development that can become a milestone in the history of both Occupy and the Commons movement is the Making Worlds conference on the Commons, February 16-18, organized by Occupy Wall Street, where members of The Future of Occupy collective will present a workshop on “Reclaiming the Commons as a social theory of collective action.” We will follow the events of the conference closely. If you want to be kept up-to-date by following our blog via email, please subscribe by clicking on follow – located on the right side panel here. A lot of work went into this. Good job. Thank you, yonosoy, for sharing that great vid! Please keep bringing to our attention what you find strategically relevant.